William Andrew Cecil Bennett PC OC (September 6, 1900 – February 23, 1979) was a Canadian politician. He was the 25th Premier of British Columbia. With just over 20 years in office, Bennett was and remains the longest-serving premier in British Columbia history. He was usually referred to as W.A.C. Bennett, although some referred to him either affectionately or mockingly as "Wacky" Bennett. To his close friends, he was known as "Cece". Bennett was born in Hastings, New Brunswick, Canada, one of five children of Andrew Havelock Bennett and Mary Emma Burns. His father was a third cousin of Richard Bedford Bennett, eleventh Prime Minister of Canada. He left formal school in grade nine, during the First World War, to take a job in a hardware store, but would pursue correspondence courses as an adult to improve his knowledge and job potential. He joined the Air Force but the war ended before he saw active duty. At the age of 18, he and his family moved to Edmonton, Alberta and then to Westlock, Alberta, where Bennett's father operated a hardware store. In 1927 Bennett married Annie Elizabeth May Richards, known as "May". In 1930 they moved to Victoria and then Kelowna with their two children, Anita and R.J. A third child, William ("Bill") was born in 1932. In Kelowna he joined the local Gyro Club, Masonic Lodge, the Kelowna Club, and was active in the United Church of Canada. Bennett opened a hardware store in 1927, in partnership with another man, and married May Bennett soon afterwards. Bennett sold his interest just before the 1929 Stock Market crash, fled the tough Alberta economic conditions, and soon moved to Kelowna, British Columbia where he opened his own hardware store, Bennett's Hardware. A successful merchant, he served as President of the Kelowna Board of Trade from 1937 to 1939. In 1932 Bennett, Giuseppe Guezzi, and Pasquale "Cap" Capozzi established a wine-making company to produce wine from the vast surplus of Okanagan apples going to waste during the Depression. Three years later Bennett and Capozzi, both teetotalers, concluded that there was no market for their apple wines and switched to making wines from California grapes. In 1936 they established Calona Wines, the name a phonetic spelling of Kelowna. Bennett departed the company in 1940 to enter politics. Bennett tried for the British Columbia Conservative Party's South Okanagan nomination for the 1937 provincial election for the British Columbia Legislative Assembly, but was unsuccessful. For the 1941 election, he won the nomination and the election. Following the election, the Conservative and Liberal parties voted to henceforth govern in coalition, an arrangement formally titled the British Columbia Coalition Organization. Not even the Socreds had expected to win the election. They had gone into the campaign without a full-time leader; their nominal leader had been Ernest George Hansell, a federal MP from Alberta. Party president Lyle Wicks convened a meeting of the newly elected MLAs to elect the province's new premier. Bennett, one of only three Socred MLAs who had any previous experience in the legislature, was elected party leader and premier-designate on July 15, 1952. Of the 19 votes cast, Bennett received 10, another received 2, and two more (including Philip Gaglardi) one vote each. The Social Credit Party won seven consecutive elections during W.A.C. Bennett's involvement and leadership: 1952, 1953, 1956, 1960, 1963, 1966, and 1969. The only election Bennett lost as a member of Social Credit was in 1972, the last election in which he was a candidate. In 1960, the Bennett government introduced British Columbia's first provincial flag, the first official provincial flag adopted west of Quebec. A fiscal conservative, he served also as the Minister of Finance, keeping tight control over government spending, while leading his province into an era of modernization and prosperity. His practice of "pay as you go" carefully tracked spending, transferred debts to other government agencies, which allowed Bennett in 1959 to claim that the province was debt free. Bennett's governments undertook a series of nationalizations to create provincial Crown corporations, including BC Ferries (1960) and BC Hydro (1961). BC Rail, formerly the Pacific Great Eastern Railway, owned by the province since 1918, underwent a series of major expansions. His Minister of Highways, Phil Gaglardi, oversaw major highway expansions and improvements. Major hydro-electric dam-building projects were undertaken on the Columbia and Peace Rivers. Bennett was instrumental in establishing the Bank of British Columbia with the government taking a 25% ownership. 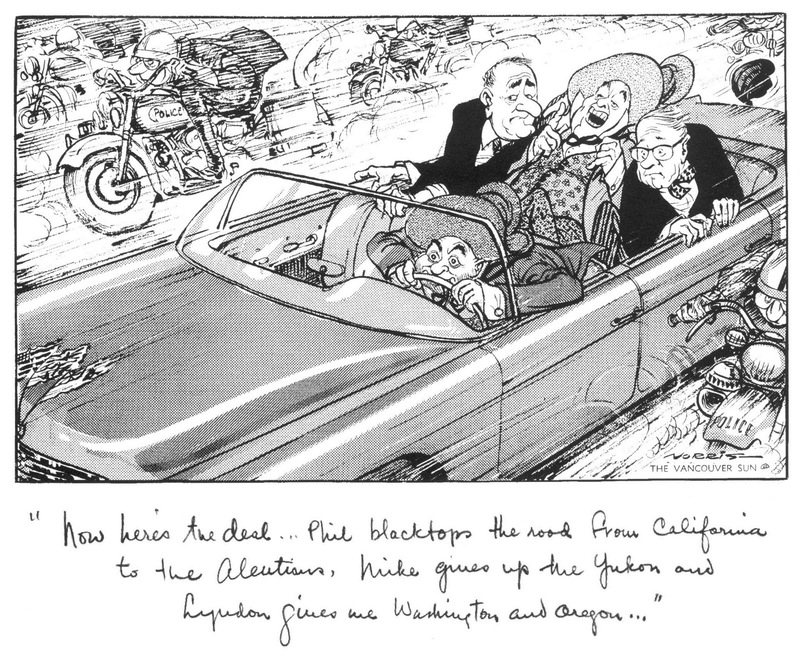 In 1961 the Columbia River Treaty was signed by Canada and the United States. Although the signatories were the federal governments of Canada and the United States, Premier Bennett was reported to have played a major part in the negotiations. Under the provisions of the treaty, the U.S. paid British Columbia C$275 million (plus interest) for the downstream power generation rights over the following 30 years. BC used the money to fund construction of dams on the Columbia River for power generation and flood control. In 1998, the Government of Canada honoured W.A.C. Bennett with his portrait on a postage stamp of Canada. The W.A.C. Bennett Dam near Hudson's Hope, built under the Two River Policy, is named after him. The library at the Burnaby campus of Simon Fraser University also bears his name. He was featured on the cover of Time Magazine on September 30, 1966. ^ Bowering's B.C. : A Swashbuckling History, by George Bowering, Toronto 1996, Penguin Canada, ISBN 978-0-14-024040-5, pp. 299-300. ^ Bowering's B.C. : A Swashbuckling History, by George Bowering, Toronto 1996, Penguin Canada, ISBN 978-0-14-024040-5, pp. 300. ^ Bowering's B.C. : A Swashbuckling History, by George Bowering, Toronto 1996, Penguin Canada, ISBN 978-0-14-024040-5, pp. 300-301. ^ "A Letter From The Publisher: Sep. 30, 1966". Time. 30 September 1966. Retrieved 5 February 2011. This page is based on the Wikipedia article W. A. C. Bennett; it is used under the Creative Commons Attribution-ShareAlike 3.0 Unported License (CC-BY-SA). You may redistribute it, verbatim or modified, providing that you comply with the terms of the CC-BY-SA.